• GUCCI polo with Kingsnake embroidery. The Kingsnake emerges as one of Alessandro Michele's signature details, adding an eclectic and unexpected touch to classic silhouettes. The embroidered appliqué is applied along the collar of the polo, along with a gold embroidered bee detail, a new iconic symbol for Gucci. 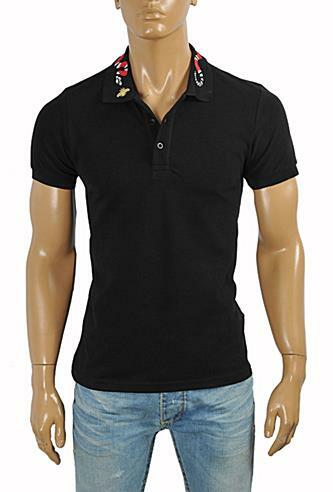 Polo Shirt is made in Italy of 100% stretch cotton piquet, Kingsnake embroidery at the collar, gold embroidered bee appliqué, black color. Width (from one armpit to the other) 19" 19½" 20½" 21" 22"
Length (from neck seam to the bottom) 28" 28½" 29" 29½" 30"
Sleeve 8" 8½" 9" 9" 9½"